Sudie Blackburn, the first woman elected to the Brownsville Independent School District Board of Trustees, who pushed for the integration of black students from the city’s only segregated school and who opposed the district’s policy of punishing students for speaking Spanish in school, has died. After being elected to the school board in 1959, Blackburn was instrumental in getting the bond issue passed that provided funds to build the new Brownsville High School on Price Road, which soon became Hanna High School. The price of the land turned out to be so reasonable that enough money was left over to purchase the land, hire an architect and build Pace and Porter high schools, her son John Blackburn said Tuesday. Blackburn has a clear recollection of the chain of events that landed his mother on the school board. It was in a way his fault, he said. He was a student at Ebony Heights Elementary School, later renamed Martin Elementary, when one day in 1959 his mother was called to the school because he and another student were speaking Spanish. “I was speaking English. He was speaking Spanish. I answered him in Spanish because he didn’t speak English. What else was I supposed to do,” Blackburn said. The reference to petunias was probably because of her involvement in the West Brownsville Garden Club, but she didn’t go home and plant petunias. She filed for the school board — over the objections of most of the men involved, Blackburn said — on a platform of alleviating the overcrowding then plaguing Brownsville schools. “My mother wasn’t afraid of anything,” Blackburn said. She was a lifelong friend of Mittie Pullam, the principal and only teacher at the Frederick Douglas School for black students, and for whom Pullam Elementary School is named. She also was friends with Gladys Porter and Camille Lightner, for whom the playhouse is named. At the time Hanna was built it was the largest construction project in South Texas, requiring a construction manager to coordinate all of the subcontractors. The design is almost unique, being based on a school in San Diego, Blackburn said. Soon after it opened in 1967 with more than 4,000 students, the school went to morning and afternoon sessions to accommodate everyone until Pace was finished. Porter followed. Sudie and Cyrus Blackburn were married in 1939 and he worked for Pan American Airways. In 1949 they decided to make Brownsville their home. In 1949 they opened Grande Radio & Television at 747 E. Elizabeth St., later changing the name to Blackburn Home Electronics. After Cyrus died in 1981 Sudie continued to operate the business until she retired in 1993. 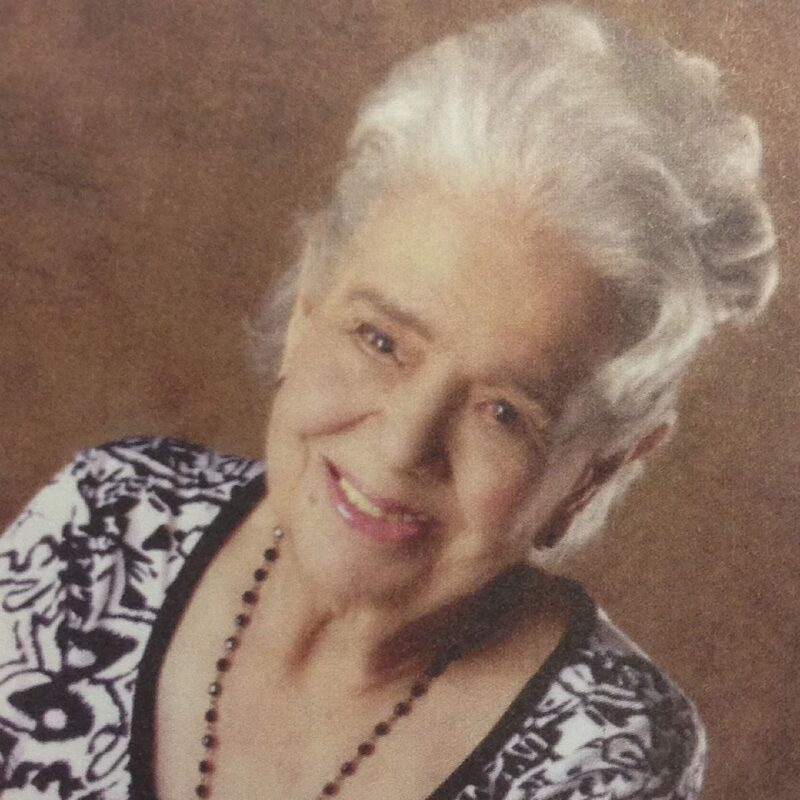 Sudie was a charter member of the Zonta Club of Brownsville and a continuous member of the West Brownsville Garden Club who was known for her flower-arranging talents. She was a certified international flower show judge and maintained her credentials until her health prevented her from pursuing this passion. She served on the Beautification Committee of Texas Highways with Lady Bird Johnson in the early 1960s. The committee worked to provide mostly native plants to provide beauty and protection from the glare of oncoming cars at night. She also was friends with Morris Clint, who operated Palm Gardens Nursery. Together they embarked on a project to replant Brownsville with the Rio Grande Valley Oak Trees that had been cut down to build the original town. She gave presentations to school and civic groups on how to plant their own oak trees. Clint propagated a unique variety of Iris called an Iris Morae and named it the “Sudie B” to honor her dedication to her adopted hometown of Brownsville. In keeping with her wishes, Sudie will be cremated by Sunset Memorial Funeral Home and Crematory. Religious Services were held at 10 a.m. Saturday, at the Central Christian Church, 1100 E. Alton Gloor Blvd., followed by a reception in her honor. Memorial tributes can be made to the West Brownsville Garden Club, C/O President Vicki Moser, 11 Casa Linda, Brownsville, Texas 78521, or other charities of choice.